Here is the header definition for the data. // Way too much junk to pass back and forth. double m_dBaseWidth; // width at base of tooth. 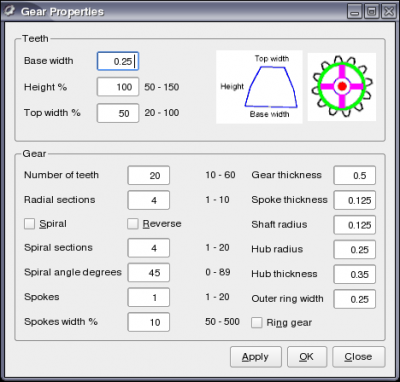 This sets diameter of gear. bool m_bSpiral; // spiral type gear? hasAcceptableInput() works correctly now that the validator objects are “new” rather than being stack items. A misunderstanding about whether they were copied into the QLineEdit object. This code provides an intelligent popup box to fix any errors. The integer objects use input masks, but the double input mask didn’t allow valid input to be entered. The validators appear to be working now. A future post will contain the valid project.